Longtime White House Protester Dies, After Vigil That Started In 1981 : The Two-Way Persisting through cold and rough weather, Concepcion Picciotto was a fixture outside the White House, where she was often called the president's closest neighbor. 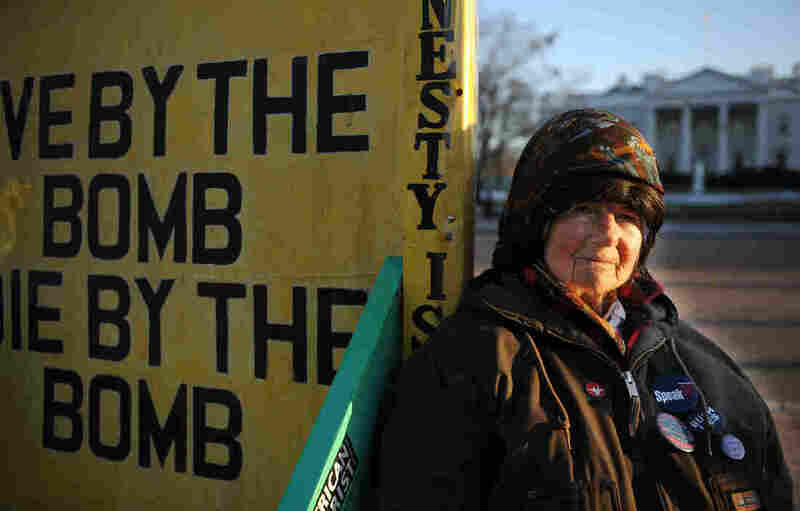 Concepcion Picciotto, who carried out a protest vigil that lasted decades, has died. She's seen here in 2009, across the street from the White House. Her protest vigil is considered the longest in U.S. history. Picciotto, who was also called Connie or Conchita, died Monday, according to the Peace House, the group that organizes the protest installation at the White House. She's believed to have been either in her 70s or early 80s (we're seeing conflicting reports). The cause of death wasn't mentioned, with a message from the Peace House saying, "Connie's health was not well for the past couple of years." From her outpost in a park on the northern side of the White House complex, Picciotto saw both tourists and presidential administrations come and go. Against a backdrop of hand-painted signs with messages like "Live by the Bomb, Die by the Bomb," she handed out pamphlets and urged people to reject violence. In 1985, an NPR report focused on Lafayette Park, the area where Picciotto spent her time. In it, she quoted Psalm 35:19, saying, "Let not them that are mine enemies wrongfully rejoice over me: neither let them wink with the eye that hate me without a cause." Picciotto's vigil was briefly interrupted one night in the fall of 2013, when the U.S. Park Police found the installation unmanned and dismantled it. The site was quickly restored by volunteers — who also have filled in for Picciotto in shifts over the years, allowing her to take breaks. Born in Spain, Picciotto emigrated to the U.S. at the age of 18 to work in New York; she moved to Washington after her marriage ended, according to a personal history she posted online. The account includes her meeting William Thomas, the man who started the protest vigil in 1981 that they occupied together until his death in 2009. "Through her presence, she said she hoped to remind others to take whatever action they could, however small, to help end wars and stop violence, particularly against children. "Ms. Picciotto, a diminutive woman perpetually clad in a helmet and headscarf, was a curious and at times controversial figure in Washington. Fellow activists lauded her as a heroine. Critics and even casual passersby, reading her hand-lettered signs, dismissed her as foolish, perhaps unwell. Ms. Picciotto was quick to share elaborate accounts of persecution by the government, which she considered responsible for many of her physical ailments."